Each player in Korrigans has two korrigans (a.k.a. fairies or spirits) and must use them to move about the landscape, claim animal tokens in order to access other parts of the land, and eventually find the pot of gold that will become visible once the rainbow's location is revealed. 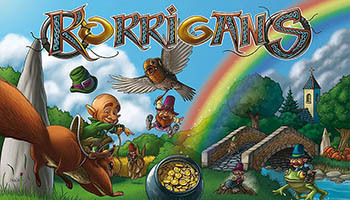 In more detail, players take their first two turns to place their korrigans on the game board; with each korrigan you place, you look at the tokens in that location and keep one of them. These tokens show either gold (which possibly gives you points at the end of the game) or an animal (which allows you to pass through gates that bear that animal to reach a different landscape). From the third turn on, players use their animal tokens to move their korrigans and pick up more tokens. Each round the player holding the bag draws a rainbow token and places it in one of the rows or columns on the board; this means that the pot of gold won't appear in this row or column in the final part of the game. Once the gold is finally placed on the game board, players have a final round in which they try to reach the pot with their korrigans. If a player reaches the pot with one korrigan, he scores 10 points and if both of his korrigans reach the pot he scores 15 points. Whoever has the highest score wins! Make your Korrigan tribe richer than the others by picking four-leaf clovers giving Gold coins and/or by moving onto the field where the Cauldron of gold appears at the end of the game.